The Detroit Chaos culminated an exciting weekend in Toronto by winning the Division 5 Hockey North America Championship in overtime, 5-4 over the Providence Falcons. This is the first Hockey North America Championship for the newly formed Chaos. 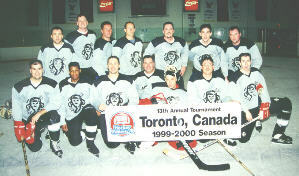 The group bonded together through 36 hours and 4 hockey games to bring home the coveted Hockey North America Championship trophies. The Chaos battled back from a slow start on Friday to reach the championship game on Sunday morning. Their first matchup of the tournament was with the Providence Falcons on Friday night. Player/Coach Steve Benninger made the gameplan simple, "Put the puck in the net", however the simple directive proved to be a challenge as the Chaos lost 4-0. It was apparent from the start that the travel schedule and unfamiliarity with teammates slowed the Chaos down. Compound that with the exceptional play of the Falcon goalie, AKA Pig Pen, AKA ZZ Top, and the Chaos were never able to get on track. The only time the Chaos were able to get one past Pig Pen, a slick breakaway scoring chance by Benninger, it was 2/10ths of a second late as time ran out in the second period. The game was physical and tempers flared. Three of the Falcons four goals were scored off the power play. To make matters worse Benninger and Todd Kjellenberg were injured during the game. Both players received lacerations that required hospital attention. Kjellenberg got the worst of the deal, requiring more than 20 stitches over his right eye as a result of a stick to the face. The Chaos limped into a Saturday morning matchup with the Detroit Lightning. But Saturday morning would prove to be Chaotic for the Lightning as they lost 10-0 to a revamped, rested, and focussed Chaos team. Benninger made some adjustments in the lineup that would strengthen not only the Chaos offense but also tighten up the defense. The big man from Oklahoma, Andy Lovell, was moved from forward to defense solidifying the Chaos defense while Kjellenberg was moved from the blue line to left forward to give the offense some added punch. The Chaos jumped on the Lightning early, scoring 2 goals in the first and 2 in the second. To finish the deed, the Chaos tacked on 6 goals in the third period. Goal scoring came from all lines with Benninger and Tim Winslow leading the rush. Crowd favorite, Joey Krizek, played stellar in goal earning the shutout. But, the Chaos didn't have much time to enjoy the victory because, on deck, the Holland Highlanders were waiting. The afternoon matchup against the European club looked to be an interesting one. The Highlanders had tied the Lightning 2-2 on Friday night. They had also lost a lopsided game against the Falcons on Saturday morning. The Highlanders were about to play what might be their last game. The Chaos needed to be careful not to take the Holland team lightly. It was time to turn up the intensity level. A win would guarantee the Chaos a spot in the Sunday morning Championship game. A loss, and their future was questionable. The game would prove to be physical and intense, but the outcome was never in doubt for the Chaos as they won 7-1. The Highlanders gameplan was to play a physical, hard checking game in an attempt to mask their lack of speed. Unfortunately for the Highlanders, each Chaos forward line was beginning to hit their stride. The line of Benninger, Jason Totzke, and Dwight Channer was the passing line, moving the puck well for several scoring opportunities. The scoring line of Winslow, Kjellenberg, and Preston Belding proved adept at putting the puck in the net. While the line of Brian Kappler, Mike MacAskill, Pete McDonald was the most physical line, punishing the opposition with superior forechecking. Meanwhile, the defensive tandems of Lovell and Rich Wagy worked quite well, with Lovell showing the ability to carry the puck and shoot from the point. Wagy excelled at smothering opposing forwards, using size and strength to take the puck. The skillful blueline tandem of PJ MacAskill and Peter Kinlin provided an offensive punch with tight, aggressive defense. Again, Krizek was strong in goal keeping the Dutch boys at bay. The table was set for a rematch against the Falcons in the Championship on Sunday. The Falcons entered the Championship 3-0 after winning a tight game against the Lightning, 3-1, Saturday afternoon. Following a night of controlled celebration the Chaos came into the Championship slightly sluggish. Injured reserve forward, Dave White, noticed the lack of intensity and demanded a wake up call. Midway through the first period, Captain Chaos, Steve Benninger answered the wake up call and scored to put the Chaos up 1-0. A see-saw battled ensued. The Falcons tieing the game then taking the lead. Belding would later tie the game, 2-2, with a beautiful goal. To their credit, the Falcons did not relent and regained the lead on a questionable power play at the end of the second period. 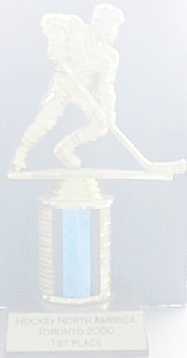 However, on the face off at the beginning of the third period, Benninger won the puck skated in from the left looking as though he was about to go behind the net, but instead cutting hard in front of Pig Pen and parking the puck in the net to cap an incredible individual effort to tie the game 3-3. Later in the third, Winslow scored on a laser shot to give the Chaos a 4-3 lead. The lead would prove difficult to hold as the Falcons stormed back to tie the game with less than 4 minutes left in regulation. The teams battled to a stalemate in the last 3 minutes setting up overtime. Overtime action was tense and furious with both teams getting quality scoring chances. Krizek came up big with a glove save on a Falcon wrist shot that proved too close for comfort. Over three minutes into the overtime Kjellenberg, affectionately known as Stitches by his fans, scored the breathtaking game winner handing the Chaos their first Hockey North America Championship. The bench spilled onto the ice mobbing Kjellenberg and Krizek. Redemption had come. After being shutout in the opener by the Falcons, the Chaos used Saturday to regroup and Sunday to attain their original goal: The Championship. In the end, there will be many memories from the weekend, Goldschlagger, JJ Muggs, locker room music, the great fans ("We must increase our Busts!!) and their support. Those memories, through time will all mix together. They'll come and go as all memories do. But ultimately, this whole thing ended up as it started, just a group of guys getting together to have a good time. The only thing different is that now they are defending champs.